After joining Balenciaga as the new creative director, Vogue spoke to the fashion designer to get an insight on how he got started in the fashion industry, his creative process, his inspirations and aspirations and more. Wang has an eponymous label, and is recognized for his youth (29), talent, and creativity. He is inspired by daily fashion, rock and roll and music in general. He pulls ideas from his comfort level, his roots and from what he knows and identifies with. 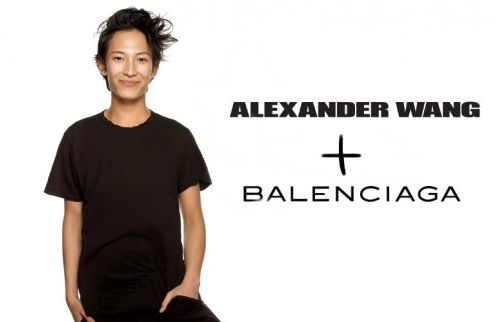 For his debut as the creative director at Balenciaga, Wang presented his first collection in front of a select audience of 40 at the firms headquarters in Paris. The show was intimate and portrayed the idea of duality: youth and tradition, as well as the contrast of past and future. Now we just have to wait and see how this creative prodigy will influence the look of Balenciaga. Watch the Vogue interview below! This entry was posted on April 12, 2013 by mcquant in News and tagged Alexander Wang, Balenciaga, creative director, creative process, Fashion, fashion industry, Vogue.